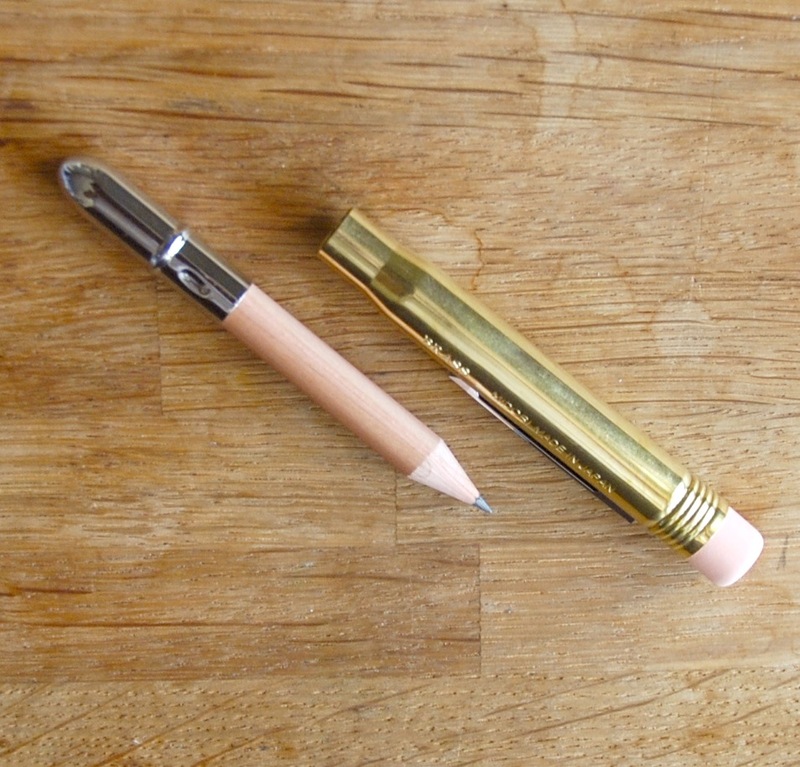 The bullet pencil is the perfect size for a trouser pocket, but sometimes one feels compelled to attach it to one’s notebook to have it close to hand when needed. 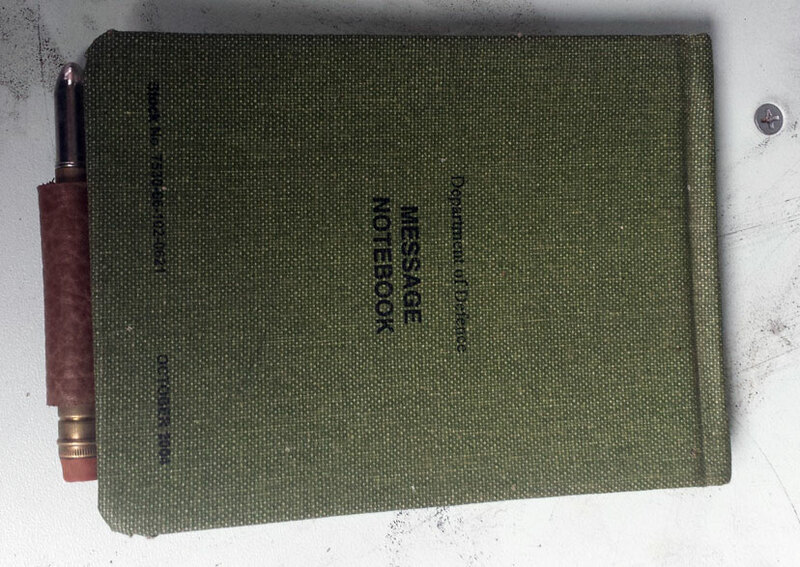 I like notebooks and I particularly like the waxed cotton-covered Australian Defence Force field message notebooks with their gridded pages and old school carbon paper insert. 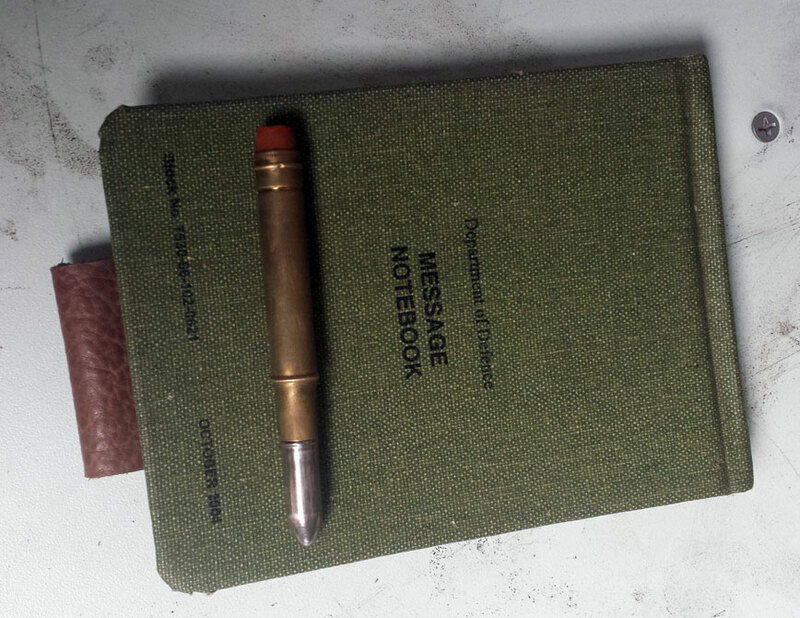 One day I glanced at a field message notebook and then I glanced at my bullet pencil, then just like the guy who invented the concept of dipping crispy bacon in maple syrup, I had an epiphany. Some of the supplies needed to perform this delicate and complex notebook hacking procedure. Step 1 – Measure a strip of leather belt to the right size. 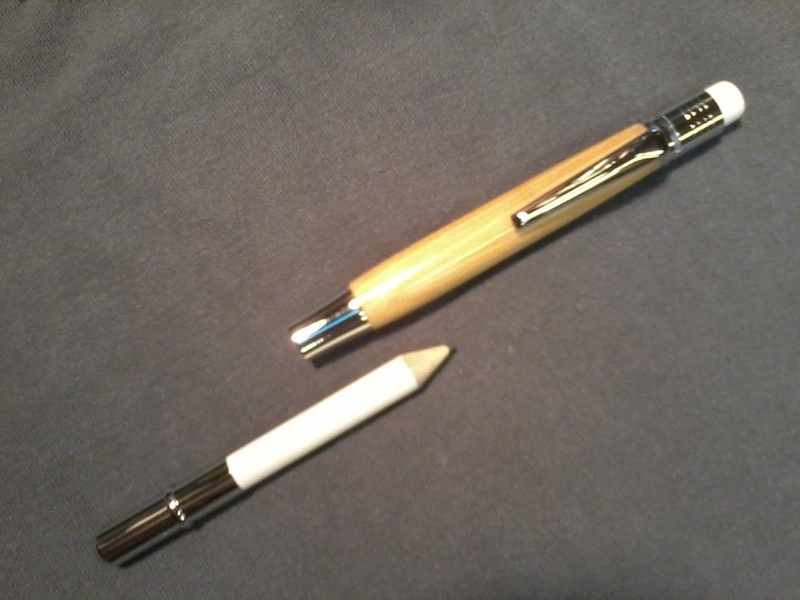 It should comfortably wrap around the bullet pencil and leave a 1/4 to 1/2 inch overlap. Using a pencil or pen mark where your rivets will go on the folded/wrapped piece of leather. Step 2 – Punch the holes using, you guessed it, a hole punch. If you don’t have a hole punch, then use a sharp and pointy instrument such as a knife point. 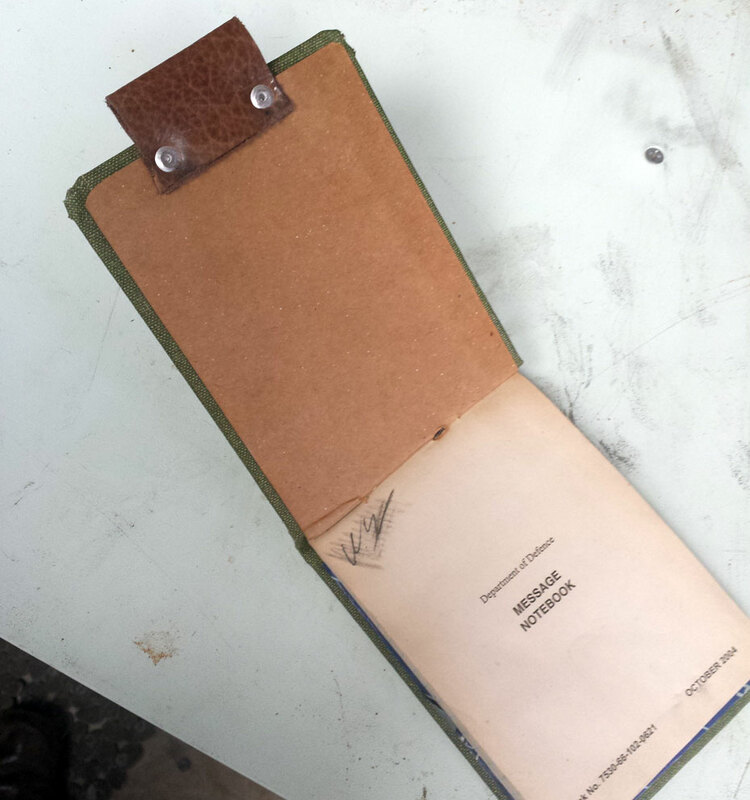 Step 3 – Using the holes in the leather as a guide, mark the holes on the cover of your notebook. Place these wherever you think a pen or pencil would sit easily and unobtrusively. 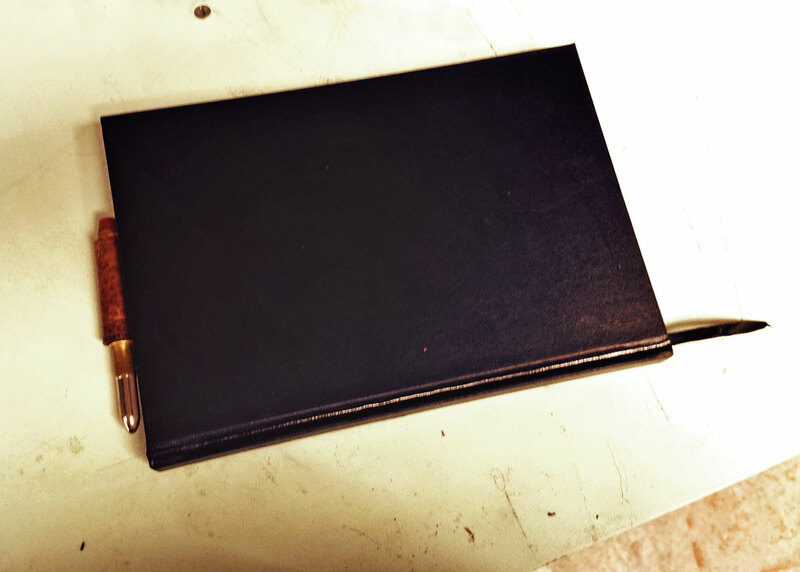 Punch, gouge or cut the holes in the cover. 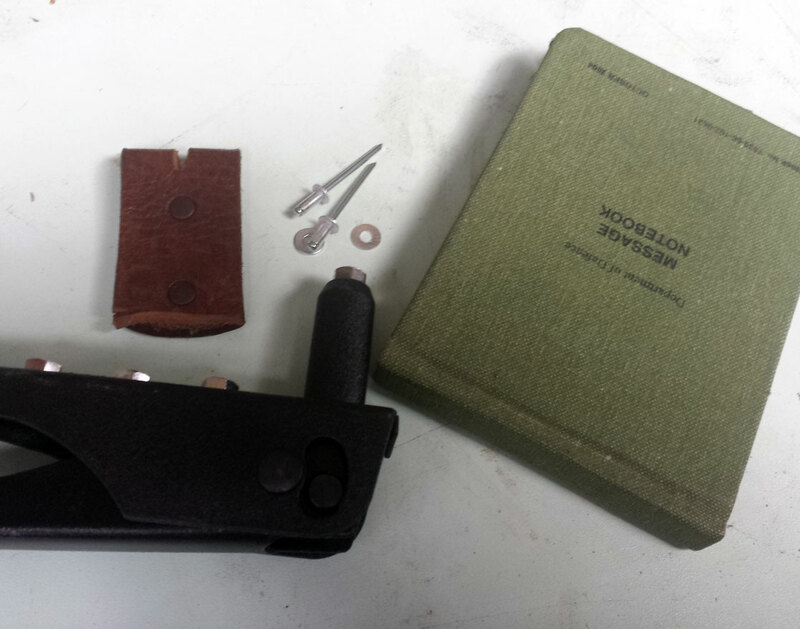 Step 4 – Place the folded leather into position on the cover and place a pop rivet head through it. Now place a washer over the rivet head as it protrudes from the other side of the cover. Step 5 – Rivet into place using the pop rivet gun. You’ll notice that the washer now becomes a flange to stop the rivet pulling out of the cover. Step 6 – repeat steps 4 and 5 with the other rivet. Step 7 – insert bullet pencil and we’re done. Inside the cover. I’ve found this configuration to give the neatest result. Outside the cover – notice how the washers now lock the rivet into position. After this has been done you can flatten out the rivets by pounding them with a big hammer if you wish. I did and found it to be a liberating experience. 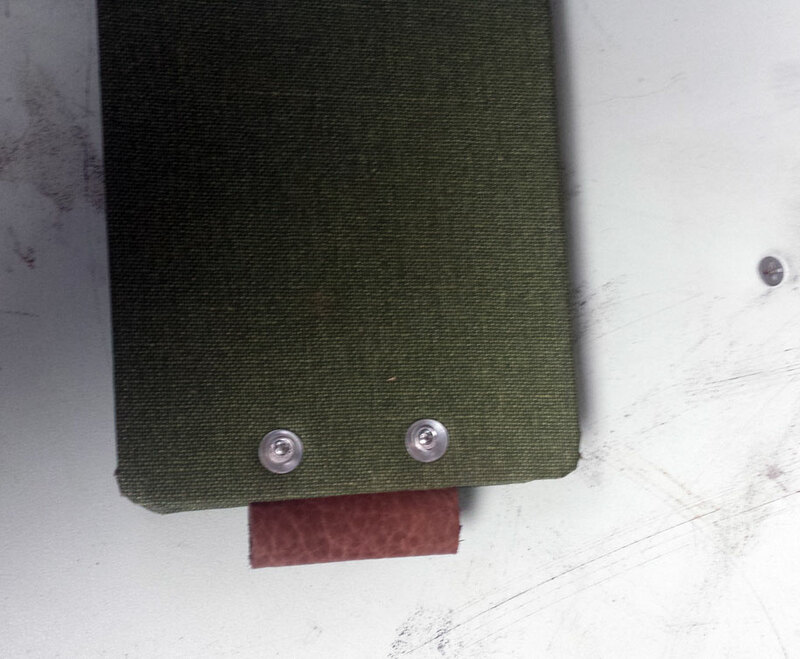 Works on any type of hard cover notebook. This one is fitted to an A5-sized sketch book. Lock and load. They aren’t called bullet pencils for nothing. If you’re a collector of these old commercial bullet pencils rather than an end user, please read no further because this post will most likely distress you. I am taking a 1930s bullet pencil and stripping all of the collector’s value out of it – every last drop. This quirky little writing instrument may have survived the ravages of the past 75-80 years, but ultimately it couldn’t survive me with its original finish and character intact. If it makes you feel any better, this bullet pencil is but one of 13 that I have acquired recently. The rest are safely packed away in their original condition and hopefully they’ll remain that way for posterity. Taking the most corroded of the bullet pencils in my small collection (see photo above, second from bottom), I will strip it back to bare brass, leaving a brushed finish which not only grips acceptably, but should develop a nice patina with age and use. The rubber eraser on this pencil is hardened and glazed, so it remains to be seen if anything can be done with it. 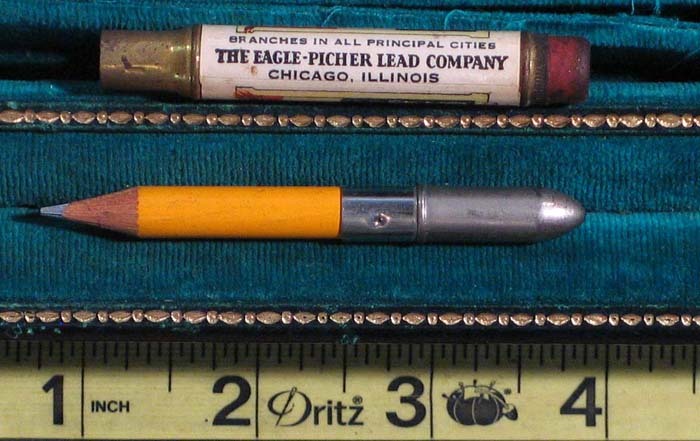 Vintage 1930s commercial bullet pencil advertising the Eagle-Picher Lead Company of Chicago – one-time purveyors of fine home and industrial paints which lead-poisoned America and the world for more than a generation. The brass barrel of this pencil is heavily tarnished and the eraser hardened and glazed. 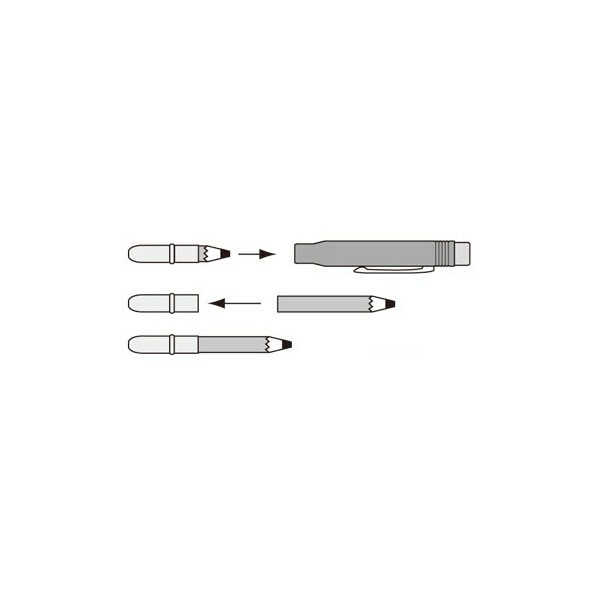 The basic components of this bullet pencil – Barrel with eraser, pencil and cap. The pencils are brand new and factory sharpened, smelling strongly of cedar wood. They are the perfect length. It’s clear these bullet pencils are unused. 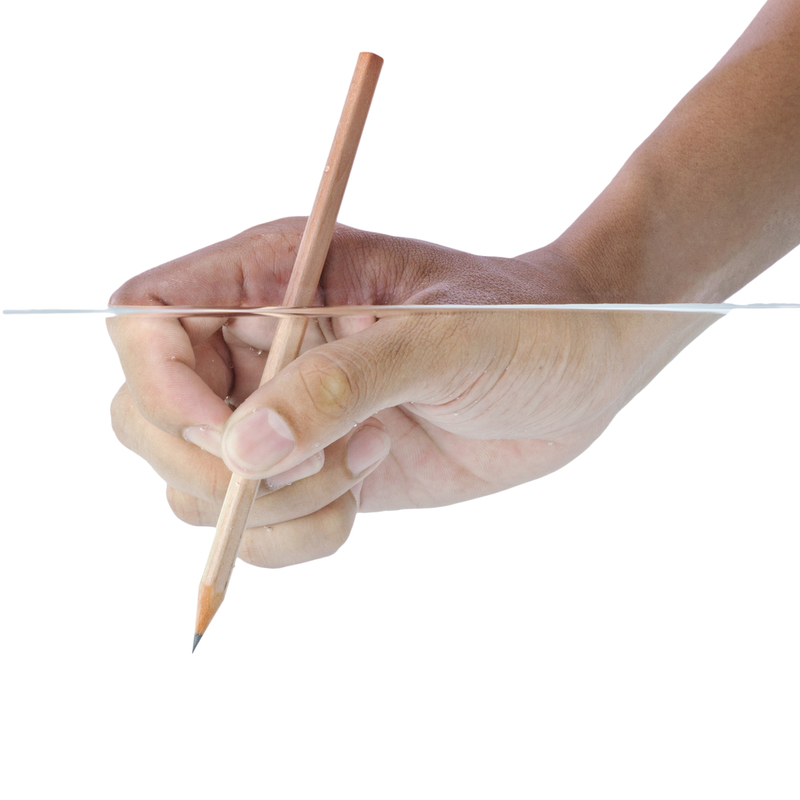 First things first – we need to strip the label off the pencil. This was accomplished with a fingernail, and the label came right off. Sadly it would not come off in one piece as the varnish had hardened into a brittle mass. During the Great Depression glossy paper for these labels would have been too expensive. In lieu, they used normal offset printing paper and “glossed” it themselves with a coat of clear varnish. This would have ensured that the paper label remained readable for as long a time as possible, thereby maximizing the advertising value of these pencils. With the label removed, we can survey the condition of the barrel. It’s in great shape. The varnish did its job well. The latex in the erasers seems to have reacted with the brass down that end and it’s heavily tarnished. Time to see if we can salvage the eraser or whether we have to invoke Plan B. With old erasers such as these, we can sometimes find that the rubber is still supple under that layer of glazing. 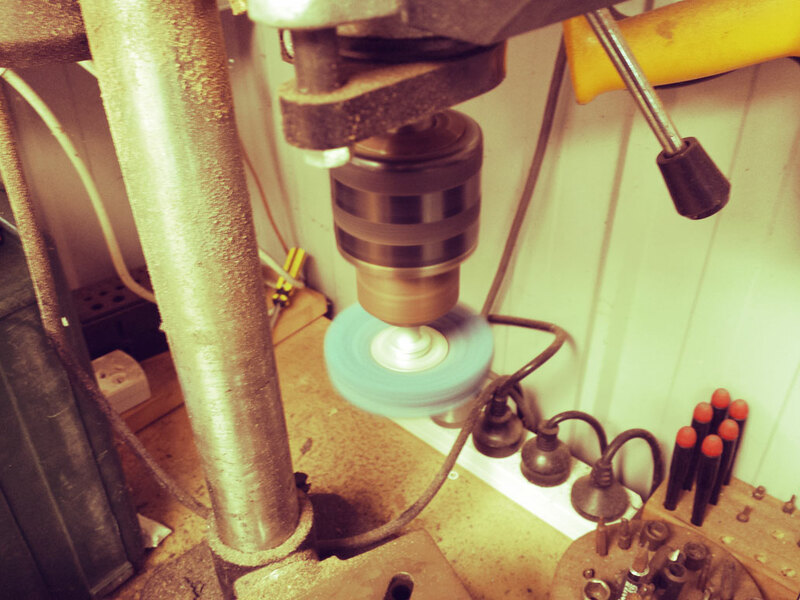 Using a light stripping wheel in a drill press, we can remove the dark glazed layer – as well as the tarnish near the end. The stripping wheel idea worked and although still a little hard, the eraser works on pencil graphite scribbled onto notepaper. All that remained to be done was to apply a “brushed” finish to the rest of the pencil barrel then reassemble it. “Restored” bullet pencil closed up. “Restored” bullet pencil in writing mode. Long before the very cool Fisher Space Bullet Pen, there was the bullet pencil. A masterpiece of simplistic and purely functional design, the bullet pencil was little more than a pencil housed in a spent rifle cartridge, traditionally a .303 British cartridge. Shaped like some heavily-chromed art deco rocket, the Fisher Space Bullet Pen writes underwater, upside down, in zero G… Inspired by the humble, old-fashioned bullet pencil. 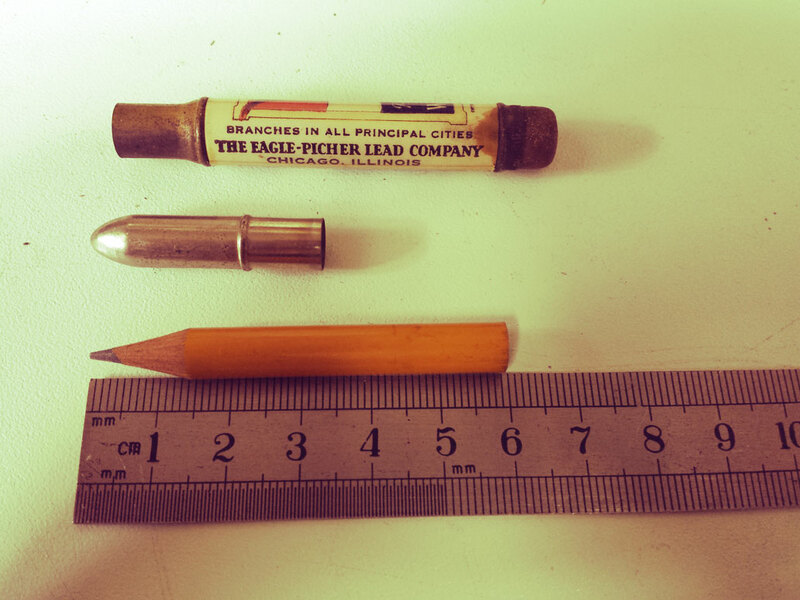 The first recorded instance of the bullet pencil appears in the late 1890s. With Britain’s various colonial adventures in Africa (South Africa and the Sudan) came a surprising new niche industry – the commemorative battle souvenir peddlers. Ghoulish opportunists picked over the battlefields at Omdurman or Ladysmith stepping over dead enemy and friendly casualties as they collected thousands of spent rifle and Maxim gun cartridges. These were sent back to Jolly Old England in bulk for processing into cheap writing instruments to be sold at a premium as battlefield souvenirs or whatever they called trench art prior to World War I. The cartridge cases were cleaned and polished, while special sterling silver or nickel-plated brass “bullets” were cast. Into these nonfunctional projectiles were initially were set one of a variety of propelling pencil mechanism.s To use, one simply removed the “projectile” from the cartridge, reversed it, advanced the graphite “lead” and wrote, sketched or scribbled to one’s heart’s content. 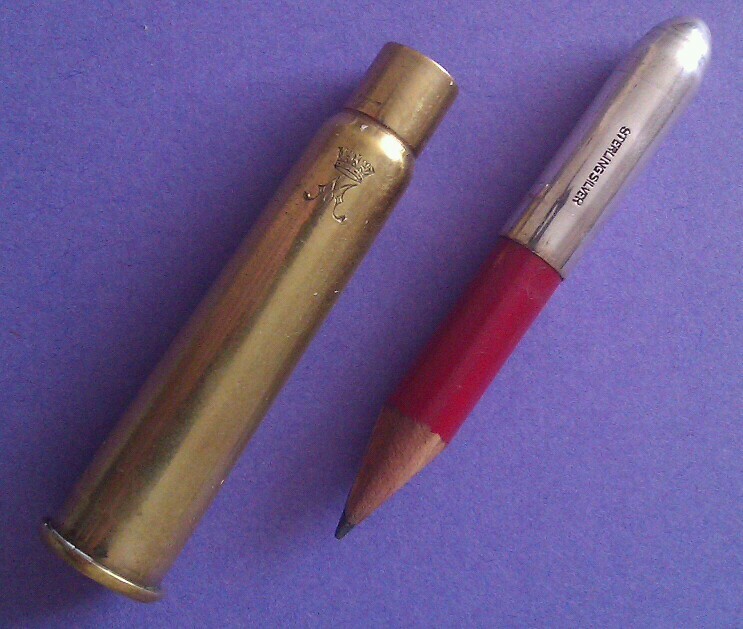 The “Omdurman” propelling bullet pencil configured for use. Unwieldy, unbalanced and inelegant compared to later versions. The next time we see the bullet pencil is 1914. As Britons prepared for what must surely be the end of the war at Christmas time in 1914, Her Royal Highness The Princess Mary was preparing her own special Chrissie prezzie for every man who “wore the King’s uniform”. This special Christmas gift took the form of a comfort package packed inside an ornate brass box issued to every British and Dominion serviceman and woman. Contents varied, but the standard box contained – a packet of pipe tobacco, a packet of cigarettes, a Christmas card and envelope, a photograph of Princess Mary and a pencil made from a spent .303 cartridge case. The Princess Mary bullet pencil was much-simplified when compared with the turn-of-the-century models. 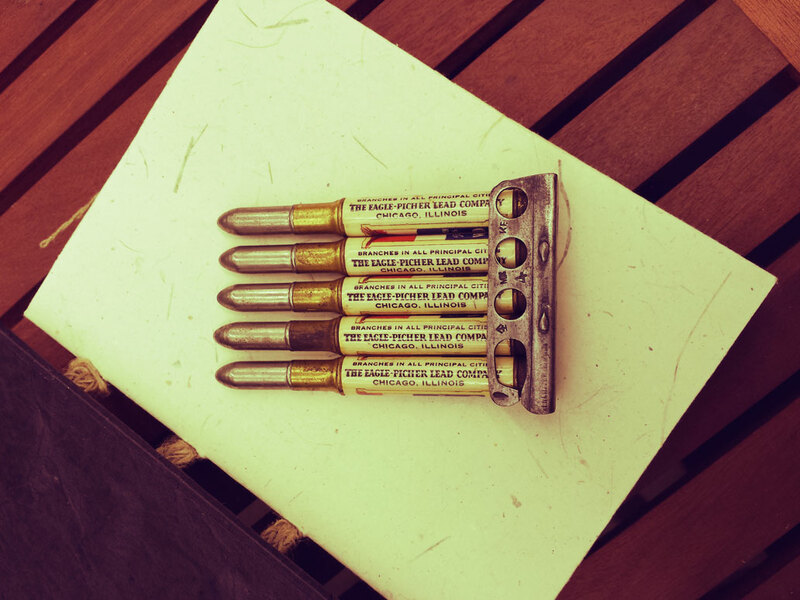 Although it also used a spent .303 cartridge case as a base, it used a bomb-proof half-pencil set into a decorative “bullet”. There were no moving parts, nothing to rust or corrode and both the cartridge case and the pencil could be replaced very easily, even on the front lines. Befitting a royal gift, the cartridge case was highly polished, lacquered and monogrammed with the Princess Mary’s seal while the “bullet” was pressed and formed from a sheet of solid sterling silver. Shorter than the earlier versions, the Princess Mary bullet pen was the perfect size for carrying in a trouser or shirt pocket under the combat conditions seen on the Western Front prior to the 1915 stalemates that led to a 3-year-long trench warfare meat grinder. 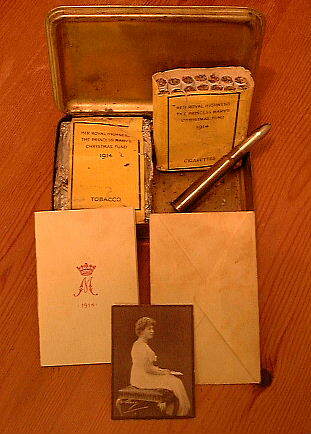 The monogrammed 1914 “Princess Mary” bullet pencil as included in the Christmas 1914 gift tins for Commonwealth troops. Simple, clean, easily refillable… Although you have to wonder how many ended up being accidentally chambered in a Lee Enfield rifle or a Vickers Gun. WIth the idea of an ever-so-useful pencil made from a cartridge case deeply ingrained in the consciousness of millions of British Commonwealth Great War Veterans, it was just a matter of time before the concept was exploited commercially on a large scale. In the 1930s, 40s and 50s, trinket manufacturers in the United States sold hundreds of thousands of bullet-style pencils made from brass or aluminium and plastered with labels advertising everything from hot dogs to sports teams to agricultural equipment to funeral homes to national monuments. These were often handed out as freely as business cards are today. 1930s-vintage commercial bullet pencil advertising an American paint company. No longer made from actual spent cartridges, the US bullet pencils retained a superficial resemblance to a .30/06 cartridge fitted with a round-nose projectile. Considered cheap and nasty at the time, many of these cheap, commercial bullet pencils were so well made, and constructed of such durable materials that they have survived well into the second decade of the 21st Century. Indeed, this writer has been lucky enough to have bought a bulk lot of vintage bullet pencils, which is sufficient as a lifetime supply. Original metal advertising bullet pencils from the 1930s, 40s and 50s can be had very cheaply if you’re in the right place at the right time. Check eBay or Etsy for bargains. A 1940 US patent drawing describing a bakelite-cased bullet pencil… the beginning of the end. 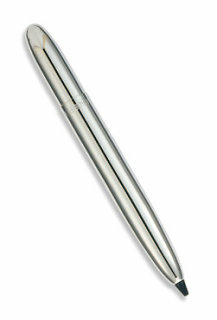 The commercial bullet pencils advanced the design to its pinnacle in the 1950s by the addition of an eraser stuck in the end and a detachable pocket clip. With the advent of mass-produced moulded celluloid and other early plastics, the stage was set for the fall of the mighty bullet pencil. Although highly popular with farmers and golfers, the bullet pencil found its niche in the United States through its adoption by Baseball, Basketball and Football umpires as their industry-standard, in-game writing instrument. The bullet pencil was the perfect shape and size to be carried unobtrusively in the front slash pockets of the umpires’ horrible black polyester trousers. The umpire’s love of the simple, but effective bullet pencil sucked the mojo right out of it. Brass and aluminium was replaced with soulless white plastic, and the pencils became mass-produced in automated Chinese sweat shops. The time of the bullet pencils had come to an end, and the original vintage metal commercial pencils became sought-after collector’s items. Instructional diagram which comes with the Midori brass bullet pencil. Then came the Renaissance. Japanese stationer to the hipster masses, Midori plugged into the nostalgia surrounding the bullet pencil and released their own version. The Midori bullet pencil echoes both its military and commercial bullet pencil heritage, wraps it all in some clean, elegant and minimalistic industrial/military-chic packaging, then sells it to you at a stupid-high premium. Midori aren’t the only modern manufacturer attempting to revive the bullet pencil. Penn State Industries in the USA have been selling their Buffalo Bullet Pencil Kits (http://www.pennstateind.com/store/PKBFPCLCH.html). Great looking kits and some of the pencils made from them by talented and skilled artisans are stunning. Besides the awesome cherry wood example from Duke’s Custom pictured above, you can find examples put together from walnut burl, corn cob, deer antler, old ivory and even stacked leather washers just like a Ka-Bar Mk1 utility knife. My only issue with the Penn State kits is that they are too long. 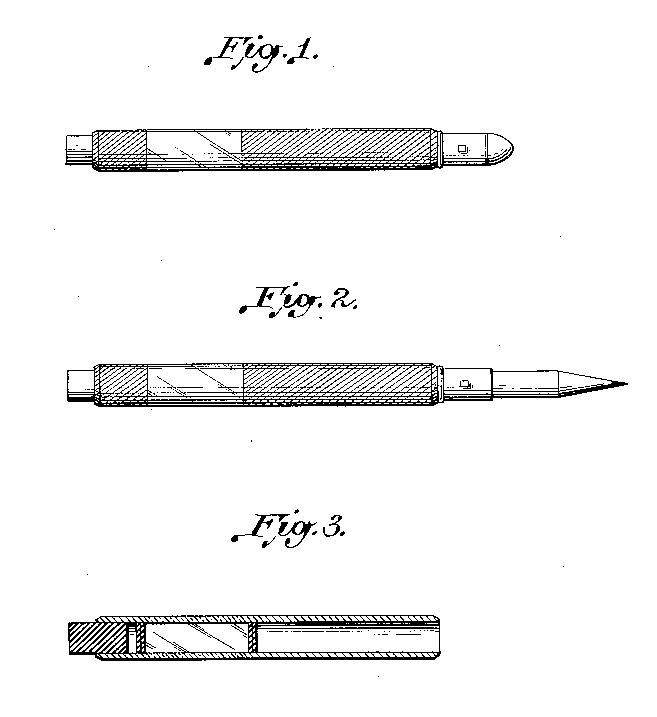 Ergonomically, they are probably fine, but they defeat the purpose of the bullet pencil, which was a compact writing instrument able to be carried unobtrusively and comfortably in a front slash trouser pocket so as to be close at hand at all times. I’m thinking of picking up some Penn State Kits and shortening them by about half an inch for my own creation – a pair of custom triangular micarta bullet pencils. Back in the 1990s, the Fisher Space Pen company tried to revive the concept of the bullet-format writing instrument with its bullet space pen. They were moderately successful and the Fisher Space bullet pens remain available for sale to this day and are very well regarded by outdoor enthusiasts and “cool guy” stationery aficionados alike. 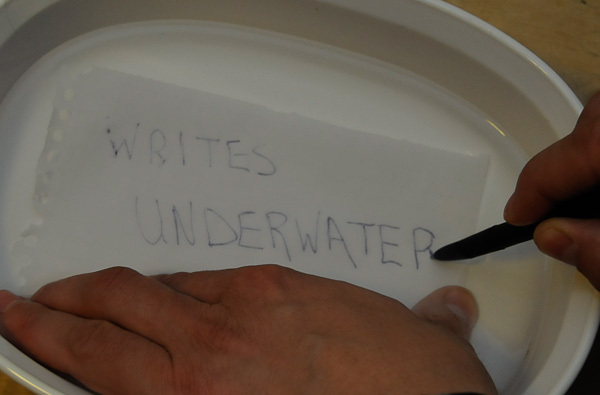 The Fisher Space Bullet Pen writes underwater. …so does a pencil. Therefore, a bullet pencil is at least as awesome as a Fisher Space Bullet Pen. 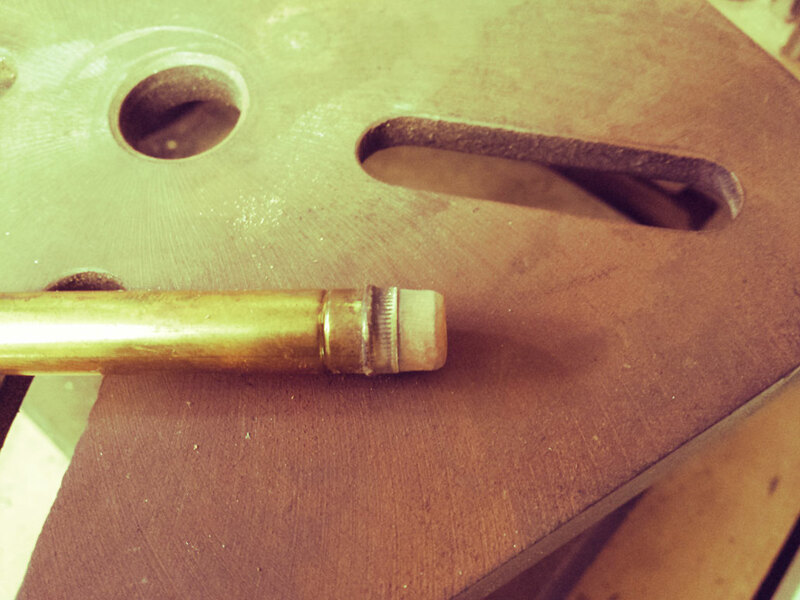 The next post in this series will look at restoring a vintage brass or aluminium commercial bullet pencil.